Everyone should have an Italian affair. Or a French affair. Twenty years ago, mine took place in Italy where my husband and I spent two weeks on a second honeymoon. We rented a villa in Baschi, a dot on the map in the neighborhood of the hill-town of Orvieto in the bucolic region of Umbria. Owned by a chef and a friend of a friend, the lovely stone farmhouse opened to vineyards behind, and a path led down a hillside of flowers to the pool. For friends joining us from Rome during the second week, we had only one request: please buy and bring four fans, for the temperature had yet to go below 100 degrees. Although the locals said it was an unusually hot June, of course air conditioning is one of several details we failed to ask about before booking. And with a seemingly mind-boggling universe of rural and urban villas, there is great value in working with one of many companies whose specialty is arranging villa vacations—especially for clients requesting celebratory “foreign affairs” such as family reunions, landmark birthdays, anniversaries, and of course, honeymoons. These companies, too, can help in arranging sightseeing around the chosen villa as they offer customized pre-trip planning as well as local hosts who can offer advice on the best places to see and what to do. In fact, says Gergel, “I get rave notices from my clients about the local hosts for Hosted Villas vacations. I don’t know how they vet their hosts, but they are amazing,” she says. Hosted Villas prides itself on offering luxurious, comfortable, charming private homes, located within the most sought-after regions and ranging from two to 10 bedrooms. In addition to customized pre-trip planning—which can focus on food and wine, cycling or health and wellness—the Hosted Villas experience includes the services of a local host, who greets guests with a cold glass of prosecco or a Kir Royale, along with a feast of local comfort foods, and then serves as guide, concierge, translator, and trouble-shooter for the balance of the stay. Sample villa & sightseeing: The five-star perennial favorite, the 5-bedroom Aire de Beaumes, set on four acres in Provence, and offering a sun room, library/TV room, dining room, fully equipped kitchen, stocked wine cellar, new fitness room, infinity pool with panoramic views, outdoor dining, and pool house with kitchen, as well as daily housekeeping (except Sunday). The villa is within walking distance of the local village; the area is particularly fine for hiking and biking; and nearby are Cote de Rhone wine villages, the market town of Carpentras, antiques in Avignon and Isle-sur-la-Sorgue, tennis and golf. Cost per week during the high-season, just ended, is $14,000 or $400 per bedroom per night; during the low season, until Dec. 20, it’s $10,700. 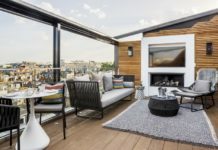 Coats adds that A&K Villas can support guests through its Hosted service option, providing a local host to advise on the best sights or the most appealing restaurants, to take care of special arrangements, to act in an offsite concierge capacity. According to Coats, the U.S. market has grown consistently for A&K over the last five years, and is now its second strongest after the UK: sales for 2013 are already 50 percent ahead of the same time last year. And priding itself as a company for all seasons, come winter, A&K Villas offers many choice chalets in the choicest of French Alpine terrains: Chamonix, Courchevel, Megeve, Meribel and Val d’Isere, as well as in Switzerland and Austria. Sample villa & sightseeing: A&K Villas has more than a few options in Europe, but the 6-bedroom L’Olivo in Umbria is idyllic. Located 10 miles from Perugia and situated on a hill with gardens, olive groves, and breathtaking views over the Apennines, the villa features a living area with fireplace; TV room with access to the porch; professionally equipped kitchen; dining room with view to the pergola; spa with sauna and whirlpool; guest bathroom with shower (disabled friendly); computer room; a tennis court; a pool and the top floor bedrooms offer a private rooftop terrace. Villa guests can easily walk to the historic town of Villa Pitignano or take excursions further afield to shop in Perugia; head for windsurfing on Lake Trasimeno, or kayaking and mountain biking in Sibilllini National Park; visit wine cellars near Assisi; go sightseeing and stay for lunch in Perugia and Orvieto. Cost per week during low season, from October to January, is $8,450. Representing several thousand villas in more than 50 destinations in France, Italy, Spain, Greece and other European countries, as well as the U.S., Caribbean and Tahiti, Villas of Distinction has been matching travelers to luxury villa rentals since 1989. Villas, ranging in size from one to 20 bedrooms, can fit every occasion: from romantic getaways and weddings to family outings and corporate reunions, and for special requests and assistance on location, villas come with onsite concierges. Additionally, the leisure company has a special place in its marketing heart for travel agent partnerships. According to Pristera, Villas of Distinction clients going to France primarily head for Provence and the Cote d’Azur, where the most frequent bookings are around St. Tropez and the Var region. In Italy, the most popular villa vacation choices are Tuscany, the Amalfi Coast and the Lake District in and around Lake Como. The company keeps agents and consumers informed about these and all its destinations via a monthly newsletter, product feature e-mails, and travel agent-only e-mails focused on special offers and incentives, such as commissions above the usual 10 percent paid on all sales. Further, the company offers a free service called villa-info.net, a generic website (no branding or phone numbers) that provides a virtual catalog of villas to add to a travel agency website as a resource in selling and booking villa vacations. Sample villa & sightseeing: In Paris, yes, in Paris, for villa rental companies in Europe often include apartments in leading capital cities. Consider a 2-bedroom (really good for one family) villa on Rue de Turenne, close to the Place des Vosges at the heart of the Marais. Furnished in an eclectic, slightly Bohemian style by its interior designer owner, accommodations comprise a large living room, atrium views from two bedrooms with baths and open-plan kitchen (with dishwasher), air conditioning, WiFi, stereo, and flat-screen TV. Access is by secure entrance with code and up one flight of stairs. Included are a wine and cheese welcome pack and weekly maid service. The neighborhood itself is a traveler’s dream full of trendy boutiques, galleries, cafes and restaurants, with the Musee Carnavalet just around the corner; it’s a short walk to the Musee Picasso and a great outdoor food market. Priced Saturday to Saturday, the cost through Dec. 31 is $465 per night. And because the company has been doing this for 40 years, they have all the details, such as car hire, transfers and extra services, down to a science. For example, in the Greek Islands CV Travel can book small boats, speedboats, private charters a private yacht or motor cruiser with an experienced skipper so your clients can sail in the Ionian Sea. Or, if it’s golf lessons in the Algarve your clients want, they can arrange that as well. In fact, those extras can include everything from having an onsite fully qualified chef or local cook to arranging a spa treatment or tennis lessons, scuba diving excursions or even making sure everything is in place for the children in the family, including babysitting services. Sample villa & sightseeing: Villa Mare e Monte in the south of Corsica, France, sleeps up to 10 guests in five en-suite bedrooms, each equipped with plasma TVs, DVD player and iPod docking stations. The villa also has a cinema, magnificent terrace, fully equipped gym, cellar and separate staff bedroom. Additionally, there’s a 77-ft. yacht available upon request. The “wow” factor here, the company says, is the large outdoor pool with stunning views. As the villa’s name suggests, it sits on a quiet hillside and offers a view of the sea. In fact, a short stroll away, clients can reach one of the Europe’s most secluded beaches, Palombaggia. The beach is also the jump-off point by boat for exploring the nature reserves of the Lavezzi and Cerbicales islands, and within a 5-minute drive, clients will be in Porto Vecchio, a bustling harbor town home to marina-side restaurants, and the old town next to the Place de la Republique. Take note: Seasons vary by house and region; in general, high-season is mid-June to September, plus Easter, Christmas, New Year’s week; mid-season is mid-April to late-October; and low-season is November to mid-April. You need to book clients far ahead for holiday and prime-time seasons. In Virtuoso Life’s recent “Travel Dreams Survey” readers mentioned that one of their “trips of a lifetime” was renting a European villa, so you’ve got plenty to choose from on that end, but one of their other trips of a lifetime was riding the Orient-Express. Of course, it’s not just about being aboard the Orient-Express train that’s the allure. It’s these mesmerizing destinations these iconic trains—Northern Belle, British Pullman, The Royal Scotsman, and the Venice Simplon-Orient Express (VSOE)—pull into that is the icing on the cake. And now this legendary hospitality company has added a new route from Venice to Stockholm aboard the Venice Simplon-Orient Express. Scandinavia offers spectacular landscapes of craggy fjords and verdant lowlands, and what better way to see them than aboard an ultra-luxe Orient-Express train. Starting in April 2013, the route will glide along the rails through Italy, Austria, Switzerland and Germany before making its way to Denmark and Sweden. The 5-night rail trip from Venice to Stockholm includes two nights prior to boarding at Hotel Cipriani, two nights aboard the VSOE and one night at the Copenhagen Marriott mid-journey. Reverse itinerary is also available. Price is $5,900 pp. Guests opting for a shorter journey may opt to travel on either of the two legs of this tour: 3-night Venice to Copenhagen ($4,400 pp) or 1-night Copenhagen to Stockholm ($2,000 pp). For more information, call (800) 524-2420 or visit orient-express.com.